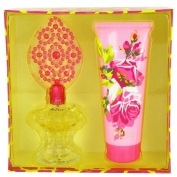 In 2006 she launches her first fragrance, Betsey Johnson, a real pop art luxury. The outer package is decorated with the details which reflect her style, leopard print and roses, while the bottle is accentuated with a very unusual and attention-drawing top. The unusual bottle was designed by Colorful Licences.